Volcanic Dome On Dwarf Planet Ceres? 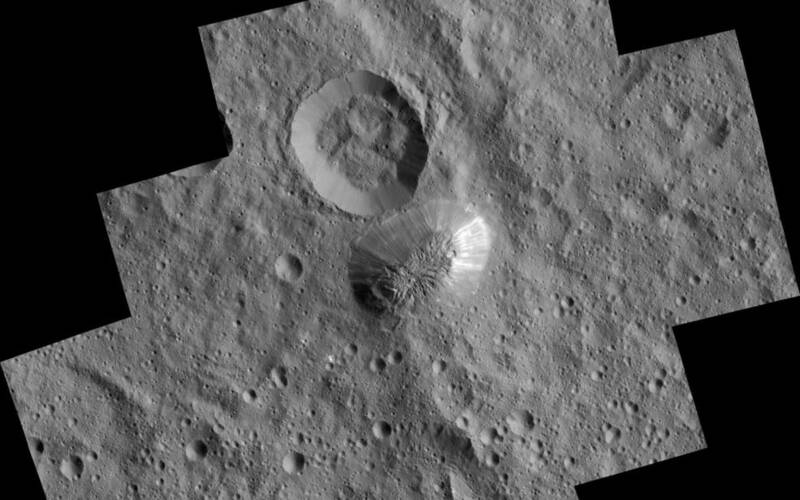 September 1, 2016 – An isolated mountain near the equator of the dwarf planet Ceres resembles a volcanic dome, according to new observations from NASA’s Dawn mission. Like the “Lonely Mountain” Erebor in J.R.R. Tolkien’s mythology, Ahuna Mons on Ceres was once occupied by a dragon, but one that “breathed” ice, not fire. The mountain likely formed as a salty-mud volcano. Instead of molten rock, salty-mud volcanoes, or “cryovolcanoes,” release frigid, salty water sometimes mixed with mud. Although the volcano is not active now, the team was surprised that it appears geologically recent. Young volcanism on an isolated dwarf planet is a surprise, as usually only planets, or satellites orbiting around them, have volcanism. Also, volcanic eruptions require bodies to be rocky, like Earth or Mars, or icy, like Saturn’s moon Enceladus. Ceres is made of salts, muddy rocks and water ice: exotic and unexpected ingredients for volcanism. Ahuna Mons on Ceres indicates such physical and chemical limitations to volcanism are only apparent. As a consequence, volcanism might be more widespread than previously thought. 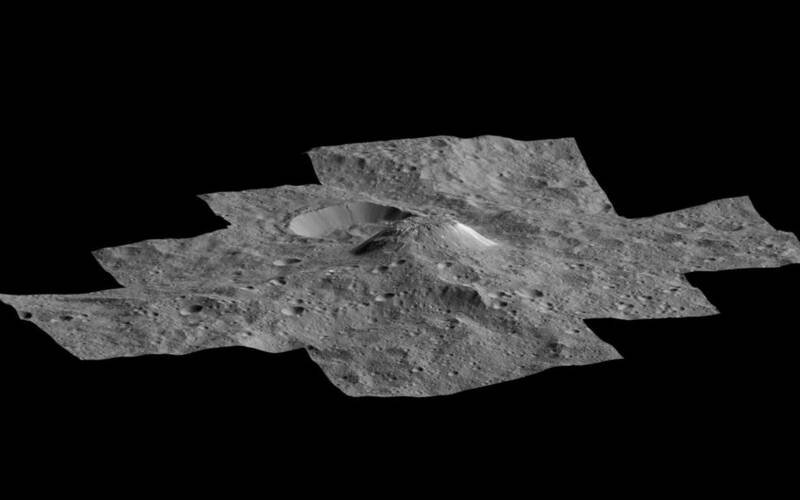 “The Ahuna Mons cryovolcano allows us to see inside Ceres,” said Ruesch. “The same process might happen on other dwarf planets like Pluto.” Ruesch is lead author of a paper on this research appearing September 2 in the journal Science. The team used images and 3-D terrain maps from the Dawn mission to analyze the shape of Ahuna Mons. They compared features and models of known mountain-building processes on Earth and Mars to the features found on Ahuna Mons. Mountains form in a variety of ways, such as the collision of crustal plates, the impacts of asteroids, and the eruptions of volcanoes. Each process gives the mountains it creates distinctive features. For example, the collision of crustal plates produces long chains or ridges of mountains instead of just a single isolated mountain, while asteroid impact craters have central peaks. Scientists concluded that Ahuna Mons most closely resembles a volcanic dome. These form when thick molten material pierces the crust but doesn’t explode or flow very far, instead squeezing up like toothpaste and building a bulge or dome on the surface. According to the team, it’s the combination of features that makes the case for a volcanic dome. For example, the summit of Ahuna Mons has cracks like those seen in volcanic domes when they expand. Also, the slopes have lines that resemble those formed by rockfalls, and the steep flanks surrounding the dome could be formed by piles of debris. The mountain’s appearance also indicates it is young on a geological timescale. Surface features on planets with little or no atmosphere like Ceres get eroded by asteroid and meteoroid impacts, and take on a soft, rounded appearance. However, Ahuna Mons is sharp, with fine features like the debris from rockfalls that should fade with time. Also, older surfaces have a heavily pockmarked appearance from the accumulation of many impacts, but Ahuna Mons has few craters. Furthermore, mountains tend to get broader as they erode and slump under gravity, but Ahuna Mons is narrow with steep slopes. Finally, surfaces tend to darken as they are exposed to radiation and meteoroid impacts in the space environment, but Ahuna Mons is brighter than its surroundings. “We’re confident that Ahuna Mons formed within the last billion years, and possibly within a few hundred million years,” said Ruesch. This is relatively new geologically, given that our solar system is about 4.5 billion years old. A young volcano on Ceres is surprising because Ceres is a small world, with a diameter about the width of Texas, and small bodies like this should quickly lose the heat from their formation. “Ahuna Mons is telling us that Ceres still had enough heat to produce a relatively recent cryovolcano,” Ruesch said. Activity of ice volcanoes is found elsewhere in our solar system. For example, Saturn’s moon Enceladus has fountains of water-ice particles streaming from cracks in the icy crust at its south pole. Enceladus is even smaller than Ceres; heat is generated inside it from flexing due to the gravitational pull of neighboring moons and Saturn. Ceres is an isolated world; there’s no neighbor nearby to give it a significant gravitational tug. “There is nothing quite like Ahuna Mons in the solar system,” said Lucy McFadden of NASA Goddard, a co-author on the paper. “It’s the first cryovolcano we’ve seen that was produced by a brine and clay mix.” The solid worlds in our solar system form a continuum from heavier, denser materials closer to the sun, such as the rocky terrestrial planets, to less dense, more volatile materials farther out, such as the icy moons of the giant planets and the Kuiper Belt objects. “Ceres, which orbits between Mars and the gas giant Jupiter, is interesting because it appears to be a transition object – it’s not completely rocky, but it’s not an ice world either,” said McFadden. The team plans to use the visible and infrared mapping spectrometer on Dawn to determine the surface composition of Ahuna Mons. The spectrometer detects the unique signatures found in light reflected from minerals to identify them. Ceres has a couple more dome-like features in other locations, but they appear older as they are broader and more heavily pockmarked by craters. It’s unknown if they are actually cryovolcanoes or if there is any connection between them and Ahuna Mons. It’s also unknown if there is any link between Ahuna Mons and the mysterious bright regions seen in hundreds of places on Ceres. Finally, the team wants to learn if there is anything special about the location of Ahuna Mons. The research was supported by the NASA Postdoctoral Program at NASA Goddard, administered by the Universities Space Research Association through a contract with NASA. Dawn was launched September 27, 2007. It is the first mission to visit a dwarf planet, and the first mission outside the Earth-moon system to orbit two distinct solar system targets. After orbiting Vesta for 14 months in 2011 and 2012, it arrived at Ceres on March 6, 2015. The mission is managed by NASA’s Jet Propulsion Laboratory, Pasadena, California for NASA’s Science Mission Directorate in Washington. Dawn is a project of the directorate’s Discovery Program, managed by NASA’s Marshall Space Flight Center in Huntsville, Alabama.